Here is a list of Best Free Photo Noise Reduction Software. These software let you reduce or completely remove noise from photos for free. Some of these software are dedicated Image noise reduction software, while some are image editors with noise reduction tools. These software provide various auto photo noise reduction as well as manual image noise reduction options. In these software, you can select the auto noise reduction options based upon the amount of noise available. The manual noise reduction options let you manually tweak parameters, such as: Lumiance, Chrominance, and Colors. While you make changes to adjust noise reduction parameters, these software also display real time preview. This way, you will know when to stop and when to increase a parameter while reducing noise and adding details. Most of these photo noise reduction software follow Median filter for noise reduction, while some follow other photo denoise methods, such as selective Gaussian Blur. Checkout the list to know more about these software, and you will also know how to reduce noise from photos using these software. I like Free Photo Noise Reduction and Chasys Draw IES Artist the most. Free Photo Noise Reduction is a dedicated tool to reduce image noise, and does its job pretty well. Chasys Draw IES Artist is an image editing software and the noise reduction options available here are awesome. You can choose the options based on your image and the amount of noise. You can also checkout the list of best free Focus Stacking Software, HDR Software, and Graphing Software. Free Photo Noise Reduction is a dedicated image noise reduction software for Windows. The best part about this software is that it displays noise reduction tips while you are at it. The options that will help you reduce noise are easy to understand and work with. Open a photo from which you want to reduce noise. To reduce photo noise, you can change the Amount and Radius of Luminance and Color. Adjust the sliders to get desired result. Real time preview is available, which displays changes as you move the sliders. You can also adjust Exposure, Contrast, and Saturation to fine tune an image for noise reduction. A floating Show Before button displays the original image when clicked. Additionally, you can also rotate or flip a photo here. It lets you open and reduce noise from a large number of image formats including RAW image formats, such as: bmp, jpg, png, tiff, arw, cr2, crw, dcr, dng, mos, nef, nrw, orf, raf, raw, and sr2. A noise reduced image can only be saved in JPEG format, which can be a set off for some users. 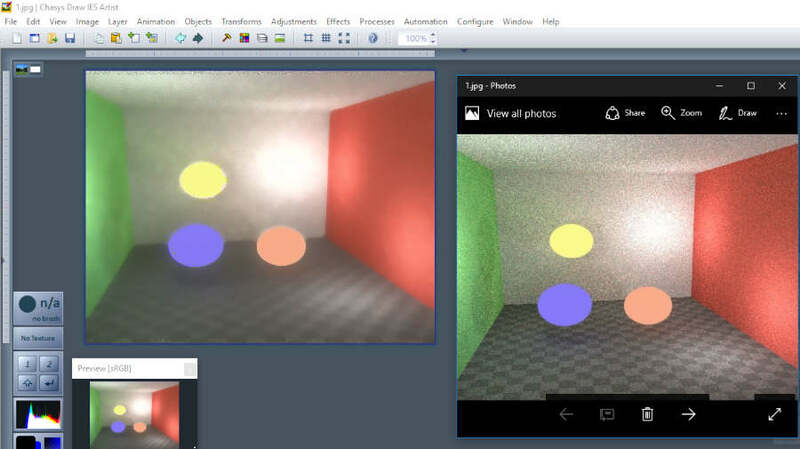 PhotoScape is a free Image editor, which you can use to reduce noise from a photo. The noise reduction tool is straight forward and hassle free. You do not have to carry out intense tweaking; simply select the amount of noise reduction required in your photo, and it will automatically carry out photo noise reduction. Open the photo with noise in the PhotoScape image editor. Go to Filter > Noise Reduction and select the Noise reduction options from Low, Middle, or High. Noise gets reduced automatically. If you do not get desired result, you can simply undo the action, and try out other levels of noise reduction. During testing, it reduced noise from the test image significantly. PhotoScape is a very good image editor, and can be used to apply various effects, filters, and edits to images. It supports a large number of image formats. Chasys Draw IES Artist is an amazing photo editing tool with noise reduction capability. 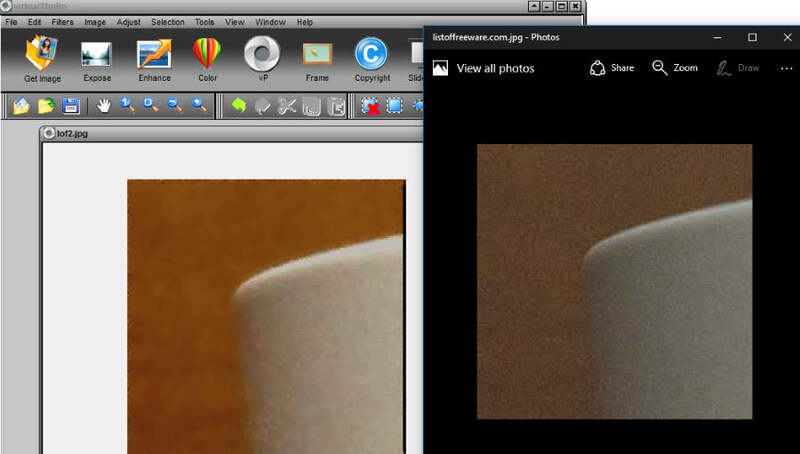 Open an image, and go to Effects > Noise to access the noise reduction modes. Linear Denoise: This mode lets you reduce noise by adjusting the blur level in a photo. You can adjust the Blurring and Threshold with the help of sliders. 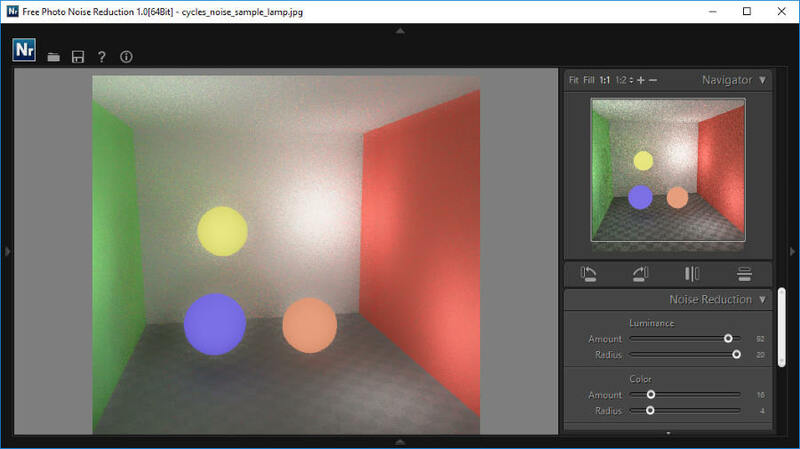 You can also select the color channels (Red, Green, Blue, and Alpha) that are to be affected by the blurring. 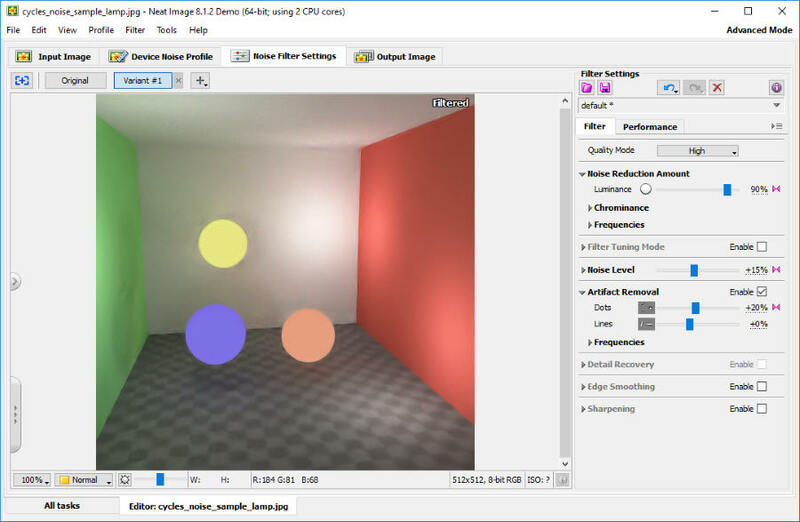 Wavelet Denoise: If you have selected this mode to reduce image noise, you will get options to adjust Lumiance and Chromiance of the photo. Both the parameters can be adjusted using sliders. Adding more lumiance reduces noise, but adds extra glow to your photo. Median Denoise: Median filter is actively used in image processing for noise reduction. It is known for edge preservation of images while blurring out noise. You can increase median radius with the help of a slider. A selective option is available to use Weighted Median while using this photo noise reduction mode. For all the modes, real time preview is available, so that you can view changes while adjusting sliders to remove noise. After applying the denoise filter, save your photo in desired image filter. You can use this software for various other purposes, which include image editing, drawing, rendering, adding effects, and much more. Neat Image is a dedicated photo noise reduction software. The free version of this software is available with full functionalities of the paid version, but you cannot use it for commercial purposes. The best part about this image noise reduction software is that, it can automatically detect and reduce noise, as well as lets you manually tweak noise reduction parameters to get desired result. Open an image with noise on this software’s interface. There are four tabs on the interface, namely: Input Image, Device Noise Profile, Noise Filter Settings, and Output Image. Click on Output Image tab, and the software automatically detects noise profile, and applies noise reduction filter with appropriate settings. The output image is displayed without noise. If you want to make more adjustments, you can go to the Noise Filter Settings tab. Here you can select the filter Quality from low, high, or highest. Sliders are available to let you adjust Noise reduction amount, Chrominance, Frequencies, Filter Tuning, Noise Level, Artifact Removal, Detail Recovery, Edge Smoothing, and Sharpening. Real time preview is displayed. After you have applied desired changes to remove photo noise, you can save you image only in JPEG format in the free version. Also, the image quality of the output file is not high for the free version. Virtual Studio is a free image editor software to enhance photos, and can be used to reduce noise from photos. The noise reduction tool is easy to use, where you have to adjust Window size and Threshold. 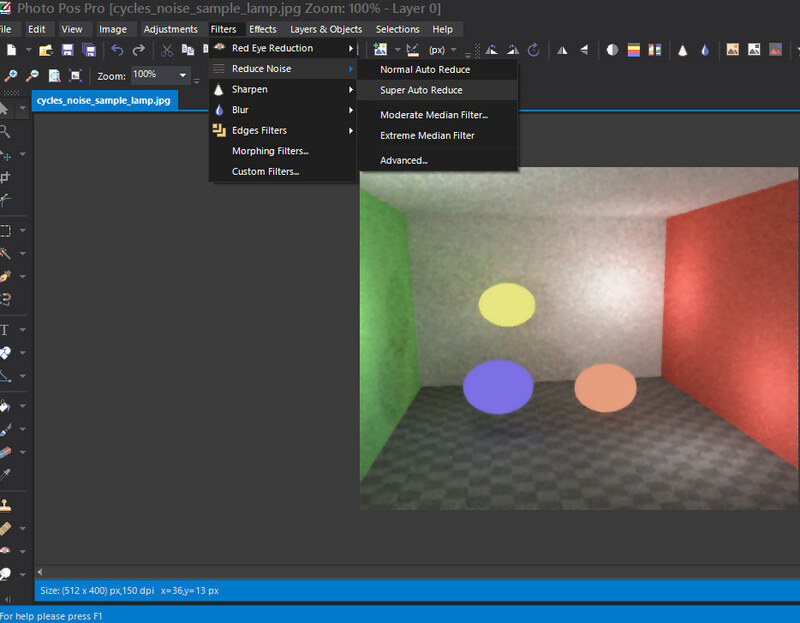 Get an image on the interface of Virtual Studio, go to Adjust tab and click on Noise Reduction. A small window opens which lets you adjust Window size and Threshold through sliders. Simply change the parameters and the change will reflect upon your image. Save the image once done. 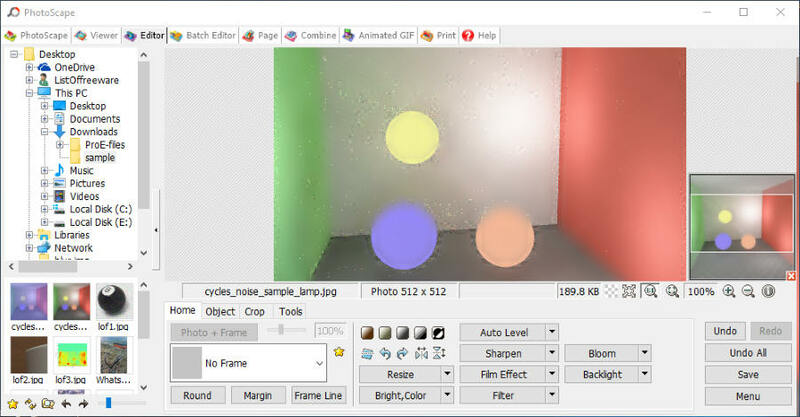 Noise was reduced significantly using this freeware to reduce photo noise. Other options let you make changes like adjust exposure, enhance image, adjust color, add frame, and much more. Paint.Net is a very famous and versatile image processing tool which can help you with reducing noise from photos. It does not have any complex options to carry out this process, and reduces noise from photos substantially. Go to Effects>Noise>Reduce Noise. A small box opens up. Here you will find sliders to adjust Radius and Strength. Adjust the sliders to get desired result on hit and trial basis. Real time changes happen on the image as you move sliders. Save your photo once you get desired result without noise. 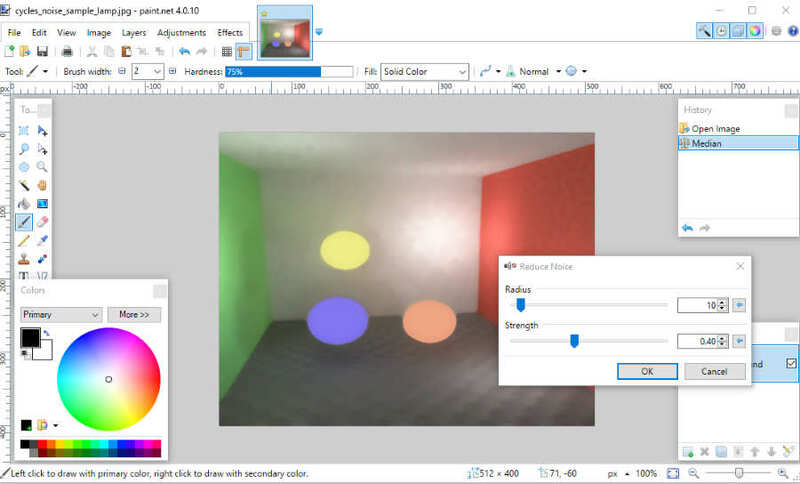 Paint.Net is famous for carrying out tricky image manipulations using its inbuilt tools as well as numerous plugins. Pixelitor is an open source photo noise reduction software. You can apply basic as well as advanced photo effects and filters on your photos here. To denoise photo, you have to open your photo in this editor, then go to Filter > Noise. Here you will find two noise filters: Reduce Single Pixel Noise and 3×3 Median Filter. Use the Reduce Single Pixel Noise option to reduce noise from photo with less noise, and 3×3 Median Filter for images with more noise. There are no manual adjustable options, hence you have to rely upon auto photo noise reduction options with this software. You can save your image in a wide variety of image formats, such as: jpeg, png, gif, bmp, tif, etc. Other options let you add gradient, crop image, paint, resize, smudge, and erase. FastStone Image Viewer is primarily an image viewer with various image manipulation tools. One of the tools helps you with reducing photo noise for free. The Image Noise Reduction Tool is available under Colors> Reduce Noise; you can also use the shortcut Ctrl+J to open the tool. Browse the folder where your noisy image is located, then select the image. Open the Noise Reduction tool. A new window opens up with a preview panel. Here you can reduce noise by increasing the Lumiance with its slider. If you want to regain image Detail, use the respective slider, but it adds noise as you increase it. You can also adjust Chromiance for fine tuning. Zoom option is available to let you zoom and see the noise reduction. Click Ok, then save your image in desired image format. Various other image tuning, color adjustments, and filters can be applied to manipulate image directly from this viewer. Photo Pos Pro is a free image editor, which can be used to carry out simple as well as advanced image editing. The Noise Reduction tool of this software is available as a Filter. It provides auto as well as manual Photo Noise Reduction options. Based on the noise in your image you can select from the following for auto noise reduction modes: Normal Auto Reduce, Super Auto Reduce, Moderate Median Filter, and Extreme Median Filter. If you want to manually adjust image noise reduction parameters, go to Filters> Reduce Noise> Advanced. A new window opens up, where you can choose from Median or Masked Median filter types. With the help of sliders, you can adjust the following parameters to get real time preview of the changes being made: Low T.H., High T.H., Inner C.V., and Outer C.V. You can also set blend mode and Opacity for Masked Median mode. Apply changes after getting a noise free image, then save your photo. A paid version of this software is also available; however, you can carry out noise reduction in the free mode, along with various other image manipulations. GIMP is a very famous open source and multi-platform image editing software. It is known for its vast array of tools and plugin support. One of the tools available let you easily denoise photos, and is known as Despeckle tool. Lets checkout the process. Go to Filters > Enhance > Despeckle. A new toolbox opens up. Here you can use two types of median noise reduction: Adaptive or Recursive. Adaptive can be used for images with fair noise, and Recursive mode can be used for images with high amount of noise. Adjust Radius, Black Level, and White Level with their respective sliders. You can see the preview panel to observe real time changes. Click Ok when done. Save your Image. There are various other ways, simple as well as advanced, to reduce photo noise. You can checkout the following tutorial to learn how to reduce CCD Noise in GIMP and Reduce Noise with selective Gaussian Blur.